Happy Friyay and a big welcome to the fourth instalment of Friday’s Frock. Yes, October is a long month! 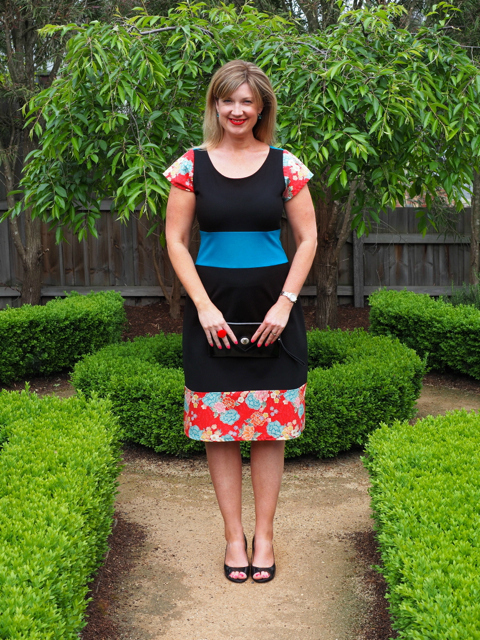 As I mentioned previously, I’m participating in Frocktober this year to raise funds and awareness for the Ovarian Cancer Research Foundation (OCRF) by wearing a fabulous frock every Friday from some of my favourite smaller, boutique and/or local designers. Today, I’m very excited to bring you two show stoppers from the fabulous Redressd – a small label run by my talented friend and fellow school Mum, Nicole. Having loved sewing and learned pattern making at high school, Nicole, who is otherwise self taught, has managed to create her own business making original handmade clothing and bags with unusual recycled and vintage fabrics. Nicole designs and makes everything herself in her home studio, so everything is beautifully made and limited edition. You won’t turn up at a do to find someone in the same frock when you’re wearing Redressd. Her attention to the little details, fun embellishments together with statement fabrics, make her dresses stand out. 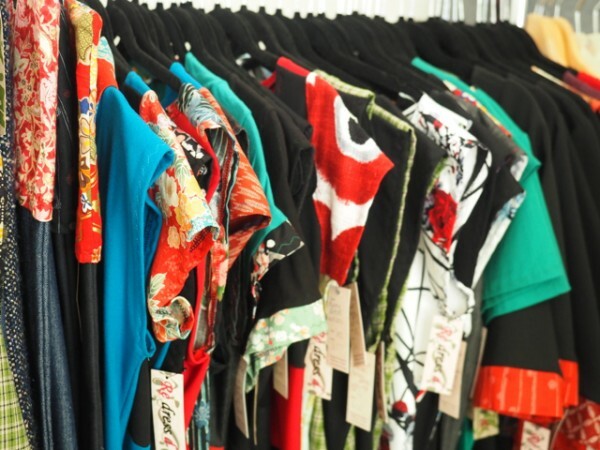 She now supplies several boutiques from Fitzroy to Darwin, is a regular at the Skirt and Shirt Market at the Abbottsford Convent and estimates that she made 500 dresses last year in her sewing room at home last year. What a clever cookie! Nicole is also happy to make all of her garments to order, so if you are looking for something that will fit you perfectly, Nicole is your go to girl. Better still, garments made to order don’t cost anything extra. How fab is that. Today, I’m wearing two of Nicole’s dresses to give you an idea of her range and sizing. The first is the Winter White Floral Dress,* $179. I’m wearing a sample in a size S.
It’s a little firm across my bust but otherwise fits as there’s some stretch (it has 5% elastane) and it’s an a-line shape. This is such a pretty frock. The black, red, grey and white colourway is a change up from the usual florals but still works back nicely with black shoes. You could pop a jacket over this frock and wear it to work or wear it more casually with ballet flats or sandals. I’m also loving the scoop neck, cap sleeve and flattering a-line skirt. 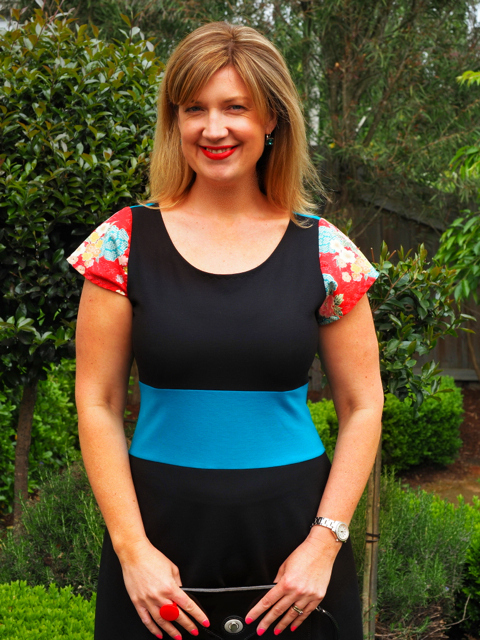 The waisted panel also emphasises the waist and would sit flatter in the right size. And on the topic of sizing, this dress is available in standard sizes XS to XXL, or made to order. 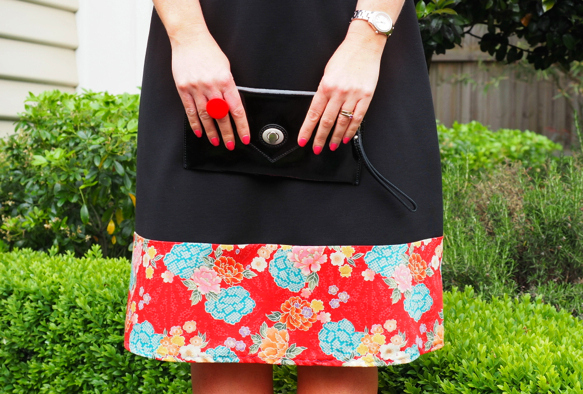 The second dress, the Japanese Red Floral Garden Panel Dress, $189,* has been made to order. Nicole measured me and then whipped it up for me later the same day, if you can believe it. If you’re fairly standard in terms of your sizing, this dress is also available in XS through to XL. Roughly speaking, my sizing is a Small up top (I know, I can’t believe it either but this ponti has stretch) and a Medium below the waist for the nice a-line shape. I’m a big fan of ponti too – it’s substantial enough that it doesn’t cling, is easy to care for (gentle machine wash) and maintains it shape. How gorgeous are the flutter sleeves and trim in this divine Japanese floral print? I’m also a huge fan of turquoise with red – such a striking contrast – but the introduction of black makes this dress simple to accessorise. Here, I’ve added some Nine West wedges, a Dinosaur Designs ring and a Mimco clutch, all from seasons past. I’m seriously loving this contrast waist panel too – it not only breaks up the black but gives shape and more colours to work with. I’ve picked up the turquoise with some inexpensive earrings from Portmans. You can find Redressd’s online shop here or visit one of here stockists. In Melbourne, Redressd is stocked at Inspirasia in Smith St, Fitzroy and The Cat’s Meow in the Flinders St Station underpass. * A big thanks to Nicole who gifted me the Japanese Red Floral Garden Panel dress and loaned me the Winter White Floral dress for today’s post. For more info, check out my Disclosure policy here. 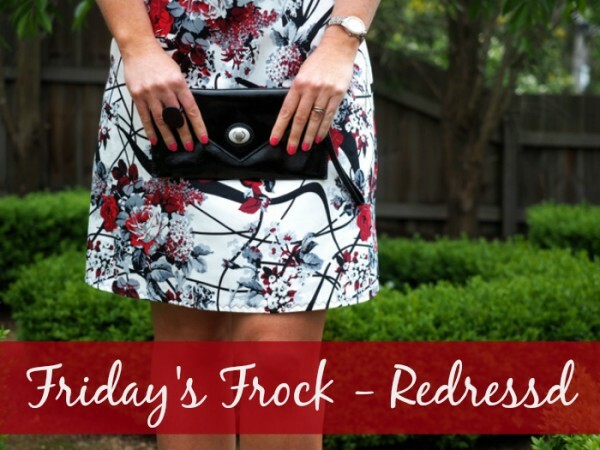 Have you heard of or shopped at Redressd before? What’s your pick of the above frocks and how would you style yours?